With so many different classes and models of vehicle on the market at any given time, making any kind of decision when purchasing a vehicle can be overwhelming. It is obviously of the utmost importance that you find the perfect vehicle that fits your style, price point and the features you want, but it is easy to overthink, or not get all the pertinent information you need to be informed. Fortunately, Certified Autoplex in Carrollton, just outside of Dallas, is here to help you with deciding what your next car is going to be. Continue reading to check out the luxurious Audi A8L, and find out if it is right for you. 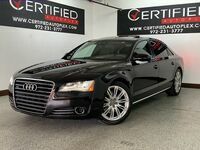 We have multiple Audi A8 L models from various model years here in Carrollton, TX. This 4-door Audi sedan is exactly what drivers have come to expect from the Audi brand. The Audi A8 L is the peak of German engineering, in terms of exterior design, performance and interior design. Keep reading to see our available Audi A8L models and their features. If you live or work in the Carrollton, TX or Dallas, TX area, and are already considering test driving or purchasing a used Audi A8 L, you can see our inventory by clicking the link below. We currently have 3 available Audi A8 L models, of which two are from 2014 and 1 is from 2016. The two model years actually have quite a few features in common. As far as performance features go, both of these models have a 3.0L V6 engine generates a whopping 333 horsepower and 325 lb-ft of torque, which is quite a bit of power for a sedan of this size. The 2014 and 2016 Audi A8 L models also have incredible handling and traction capabilities. Both the 2014 and 2016 models have an 8-speed automatic transmission, as well as an all-wheel drivetrain, to keep the driver in complete control of the vehicle at all times. The interior is also incredibly spacious and luxurious in the Audi A8 L. With 41 inches of front legroom and 43 inches of rear legroom, nearly everyone will be able to fit more than comfortably in this vehicle. Additionally, it has great technological features like a 14-speaker premium audio system with amplifier, voice-activated navigation system, a touchscreen dashboard monitor and much more.